Governor Nikki Haley has proclaimed March 2016 Prescribed Fire Awareness Month in South Carolina. A coalition of state, federal and non-governmental land management organizations under the umbrella of the South Carolina Prescribed Fire Council, including the S.C. Department of Natural Resources (DNR), requested the proclamation to raise awareness of the essential role that fire plays in both the stewardship of our natural resources and the protection of lives and property. Prescribed, or controlled, burning is the skilled application of fire under planned weather and fuel conditions to achieve specific forest and land management objectives. Controlled burning is an ancient practice, notably used by Native Americans for crop management, insect and pest control, and hunting habitat improvement, among other purposes. The practice continues today under the direction of land managers who understand the appropriate weather conditions, fuel loads and atmospheric conditions for conducting such burns. These carefully applied fires are an important tool to reduce wildfires, maintain wildlife habitat, and keep the more than 13 million acres of forested land in South Carolina healthy and productive. While prescribed burning cannot stop all wildfires, it is the best management tool available for preventing larger and more frequent outbreaks. 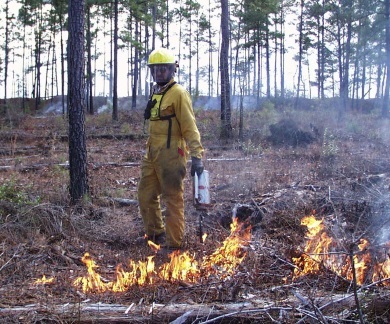 "Prescribed burning is not only the most effective, economical protection against wildfires because it reduces accumulated fuels," said Haley in her proclamation, "but it is also a key tool in managing and maintaining the ecological integrity of South Carolina’s woodlands, grasslands, agricultural areas and wildlife habitats." Johnny Stowe, DNR Heritage Preserve manager, wildlife biologist and forester, said about 500,000 acres are prescribed burned every year in South Carolina, but at least one million acres should be burned annually. "The benefits of prescribed burning are many and varied," said Stowe. "Not only does it reduce the severity of wildfires, but it also improves wildlife habitat, increases recreation opportunities and protects the aesthetic value of our forestlands. "We are fortunate in South Carolina to have government leaders who understand and appreciate the economic, public safety and ecological benefits of prescribed fire," said Stowe. "The South Carolina Prescribed Fire Council is devoted to promoting the right to use prescribed fire and encourages its use. Prescribed fire is an economically and ecologically sound practice on most forest sites in our state." For more information on prescribed burning, visit the DNR website on the benefits of prescribed burning.